There’s a video of a classic car from the 50’s hitting a modern car head-on (first – what a waste!) If you’ve seen it, you were possibly surprised (I was) about the way the massive 50’s car crumpled and the modern car took lighter damage thanks to upgrades in how cars are made today. 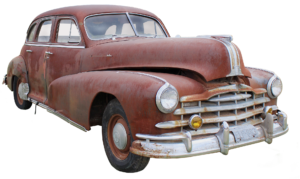 Most vintage automobiles (and trucks) were created before we knew a lot about automotive safety. Sure, each model is a safe as it possibly can be, but these beauties were built long before airbags and modern braking systems came into existence. Some of them, depending on exactly how old they are, don’t even have seat belts. Lap-style seat belts were invented in 1885 by Edward J. Claghorn, and the shoulder harness was invented by Nis Bohlin and was installed in the 1959 Volvo. In the 1900’s, some models were fitted with seat belts, but it wasn’t so much for safety if the car’s crashed. It was so people wouldn’t bounce out of the cars. It wasn’t until 1968 that seat belts (lap belts) were required to be installed in new American-made cars and trucks. (It wasn’t mandatory to actually WEAR them until 1985, and even then, two states held out – Nevada and Idaho. First, use the safety gear that came in the car. If lap belts are all that’s there, sure there are a lot of disadvantages with them, but they can keep your head from hitting the windshield or dashboard. Second, if you’re making changes to a vintage vehicle, ask a professional installer if it would makes sense (increase your safety) if you have a three point harness installed. Third, keep the brakes properly maintained. Remember, they’re stopping a machine that outweighs a lot of other things on the road with old technology that’s been vastly improved in newer cars. You might even consider asking a professional mechanic if it would make sense to upgrade to a modern braking system. You obviously wouldn’t want to this to an all-original car due to its value in original condition, but if something can potentially save your life and your family’s life, it’s worth at least checking into. Slow down. (I know – nobody in a muscle car has one because they want to go SLOW) but, for safety’s sake, reducing your speed can save your life is you happen to get in an accident. Reducing your speed puts less kinetic energy behind you, it increases your control over your vehicle, and it gives more time to react if someone in front of you veers out of control. You unfortunately have to remember that in an older vehicle, there is generally no integrated crumple zone to protect you, and the crumple zone was often the coach where the people sit. Thanks for visiting Classic Cars Online US!